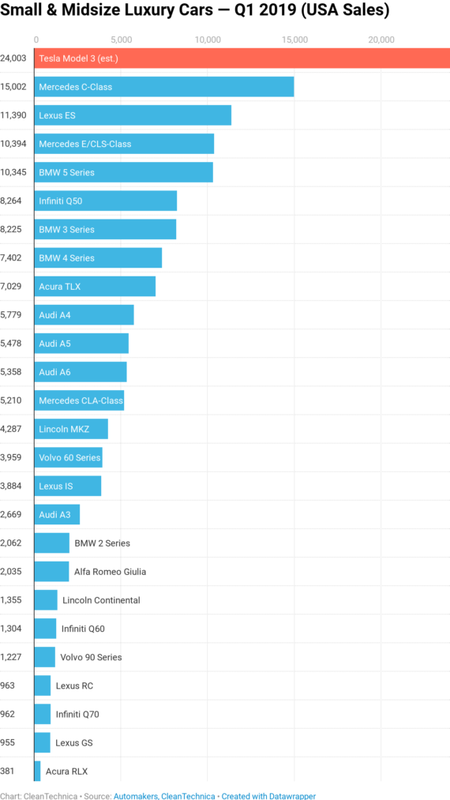 In the first quarter of 2019, the Tesla Model 3 was again the # 1 top selling car in the US luxury car market. It was far and away the winner. It was actually # 13 in the overall US car market, and no other premium-class car even made the top 20. 6% of both markets combined. I guess it depends on one's expectations whether this is a win for Tesla or not, but there is no denying that it's a big deal for a single model to take 16% of the market (or two markets combined), especially when that model comes from a young company just started mass producing the vehicle a few quarters ago. Mercedes, BMW, and Audi certainly aren't dying, but there's a big shot in town. Additionally, Mercedes, BWM, and Audi are all down in the USA compared to last year, indicating that they are bleeding in bit. To see how all of these models have changed over time in the past 15 months, check out the next two charts – just to click the little balls at the top of the charts to move from one quarter to the next. There are more ways to play with the numbers in order to put Tesla's first quarter performance into perspective, but I think that's enough for this article. its small and midsized luxury class competitors, also published articles about the model 3's place among the top selling cars in the usa and tesla's overall position in the luxury car and luxury vehicle market in the usa. Interested in buying a Tesla? Need a referral code to get 1,000 miles of free Supercharging? Use ours: http://ts.la/tomasz7234 (or not – up to you).